Long weekends are very much a time for treats. Lie-ins, nice breakfasts and all of the cookery shows and American soap operas I can shove into my brain before the housemates demand the remote control back. One thing I'm not going to be doing in a hurry tomorrow is getting dressed properly. This lingerie set from Silk & Sawdust just inspires lounging about. It looks like a little playsuit (impractical) but it's actually a little shorts and camisole set in the most gorgeous taupe colour (pretty and practical for peeing). I like the colour taupe. It's the easiest way to blag chicness and elegance. (See also, camel.) 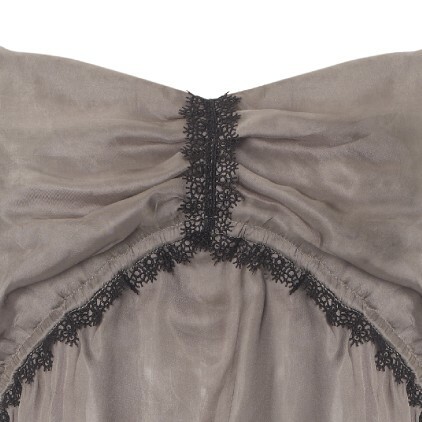 It's in brushed satin and has some very pretty detailing going on. The set is £89.99 - Silk & Sawdust have always been a little expensive. The set goes up to a size 16 and you can buy it from Bouf. Since it's the last Bank Holiday of the year, you can ignore bank statements for another day and curl up on the sofa to watch more West Wing reruns.